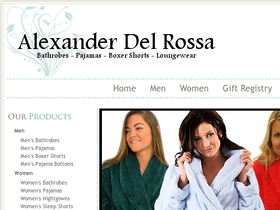 At Del Rossa, online at DelRossa.com, you can find luxurious lounge wear and sleepwear for men and women. Del Rossa sells fleece bathrobes, silk and satin robes, and terry cotton bathrobes for women as well as cotton bathrobes, terry cloth, satin, silk, and microfleece bathrobes for men. Women can also pick up satin and silk camisoles and nightgowns at Del Rossa. Men can choose from a large selection of fleece, silk, cotton, and satin pajamas and boxer shorts at Del Rossa. Satin, cotton, silk, and fleece pajamas are also available for women at Del Rossa as well as sleep shorts. RetailSteal.com has the best Del Rossa coupon codes, Del Rossa discounts, Del Rossa coupons, and Del Rossa promo codes. Shipping and handling rates at Del Rossa depend on the pricing of your purchase and your shipping destination. Free shipping is offered for orders over $100. See website for full details since some exclusions may apply. Use the coupon code at Del Rossa to save 5% on your online purchase. Click link to shop now. At Del Rossa, purchase a men's terry velour cotton bathrobe for as low as $18.99. Click link to shop now. Shop at DelRossa.com and pay only $24.99 for a pack of three men's satin boxer shorts. Click link for savings. At Del Rossa, you can buy a women's satin nightgown for only $24.99. Click link now. Buy select women's silk pajama sets for $59 when you shop online at Del Rossa. Click link to purchase now. Shop at Del Rossa and get free shipping when you spend $100 or more online. Click link to shop.